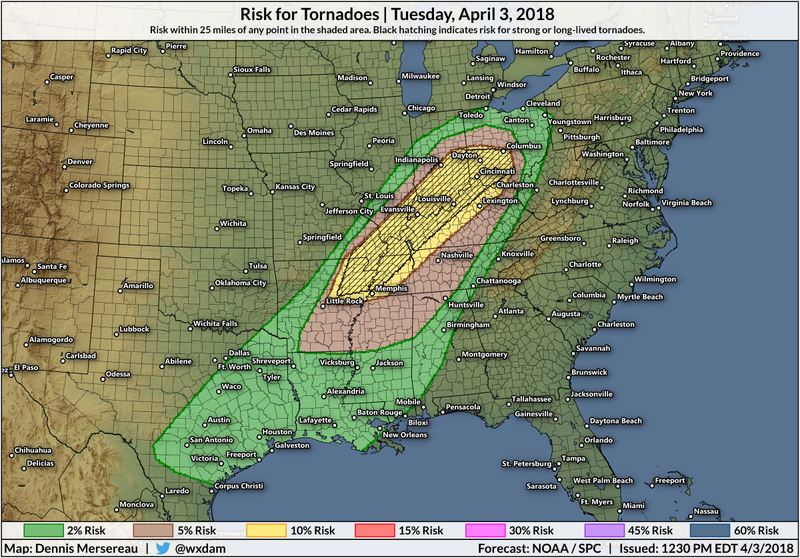 A widespread severe weather outbreak is likely on Tuesday in the central United States, covering just about everyone from the Midwest east through the Appalachian Mountains. The Storm Prediction Center expects the worst storms to occur around the Mississippi and Ohio River Valleys, roughly stretching from Memphis, Tennessee, to Dayton, Ohio, where the strongest wind gusts, largest hail, and most significant tornadoes are possible. All of the ingredients are in place today for severe weather in the middle of the country. 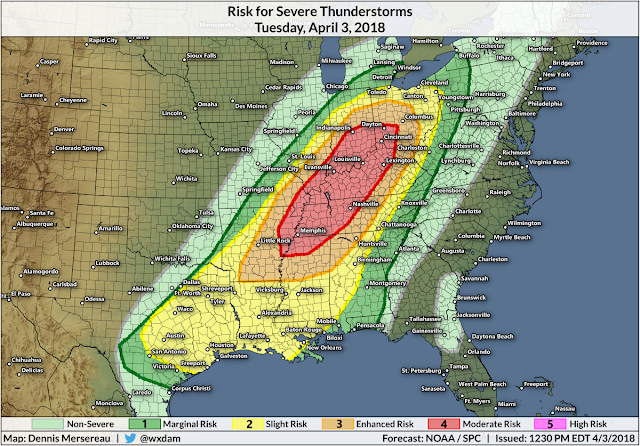 A moderate risk for severe weather—a four out of five on the scale used to measure the threat for severe weather—exists from the Mid-South through central Indiana and Ohio. Severe thunderstorms are also possible as far west as the Dallas metro area, as far north as southeastern Michigan, and all the way down to the northern Gulf Coast. 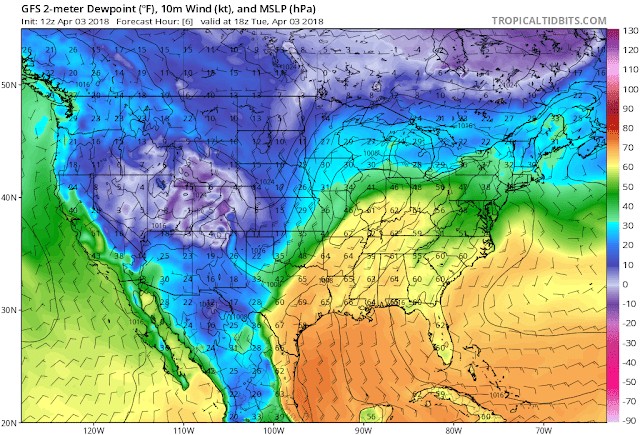 Today has all the hallmarks of a classic early spring severe weather event. A cold front extending from a low-pressure system approaching the Great Lakes will serve as the focal point for thunderstorm development this afternoon and tonight. Warm, soupy air flowing north from the Gulf of Mexico will give the storms the fuel they need to thrive once they get going. Veering winds between the lower-levels and upper-levels of the atmosphere will help thunderstorm updrafts start rotating and form into supercells that can produce the largest hail and most significant tornadoes. Discrete storms that form today have the greatest chance to produce hail and tornadoes. The greatest threat for damaging winds will occur later in the evening when storms form into one or more squall lines as they move east along the cold front. The Storm Prediction Center has outlined a large area at risk of significant tornadoes today. A significant tornado is a strong, long-lived tornado that could do significant damage along a long path. 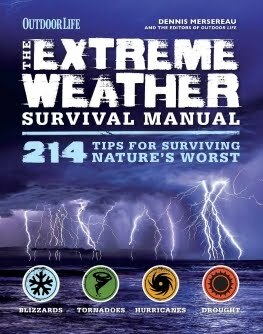 It's important to remember that it's impossible to know the strength of a tornado until after the fact, and that even a small or "weak" tornado is a life-threatening emergency. 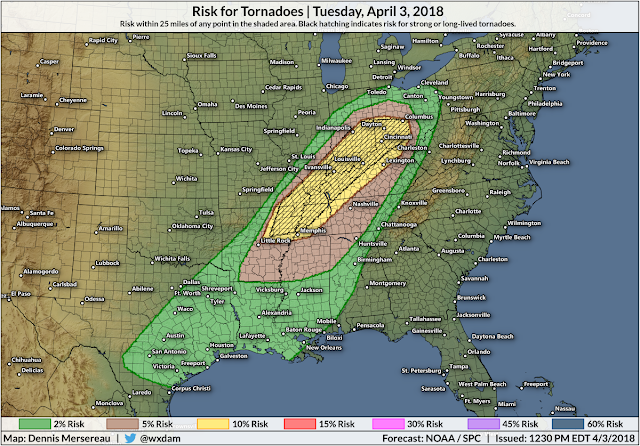 The greatest threat for tornadoes exists across the areas painted under a moderate risk, stretching from northeastern Arkansas through central Ohio. The threat for severe weather will end from west to east through the nighttime hours. More isolated severe thunderstorms are possible along the eastern seaboard during the day on Wednesday.